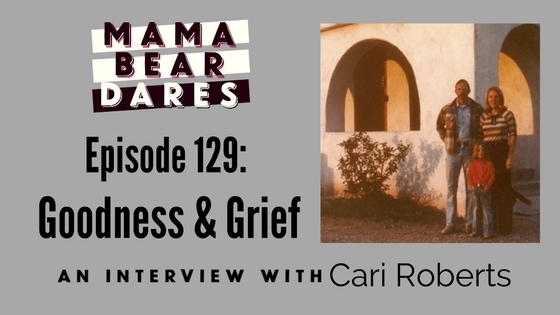 On Episode 129 of the Mama Bear Dares Podcast, Tesi and Leslie sit down with Cari Roberts, a guest nominated by a listener for her activism, love, and belief in the good. Immediately smitten by Cari's lovely personality, the hosts dive deep into her story, the challenges she's had to overcome, and how she has been changed because of them. The three women discuss everything from the grief that followed the tragic death of Cari's parents to the way we can talk to our teenagers about hard things to raising chickens in the backyard. Somehow, it's a conversation that's simultaneously deep, difficult, and an absolutely delightful. This Episode was sponsored by rxbar. Click here to save 25% of your order with the promo code Mama Bear Dares! Share some love and leave the Mama Bears a review on itunes!